Karonga is rich but its people are wallowing in poverty. They are suffering amidst plenty. They have palm and cocoa plants, rice and bananas. In the past, an attempt was made to increase the production of rice and embrace value addition in rice production but large volumes continue to be sold unprocessed. High value but little-known crops such as cocoa and palm are in abundance in the lakeshore district and Tanzania has seen an opportunity to get these precious commodities and take them across the border. 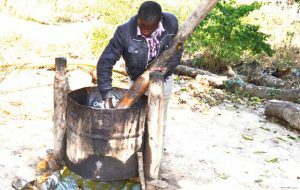 There are hundreds of palm and cocoa trees in the district on what can be termed as Malawi’s rainforest but there is little or no value addition at all, except for traditional extraction of palm oils as practiced by 33 members of Lusekelo Community Savings and Investments Promotion (Comsip) Cluster in Traditional Authority Mwakaboko. The area boasts of a vast hectarage of palm trees which produce tonnes of palm nuts annually that can be crushed into edible palm oils and cosmetics such as palm kernel oil for body lotion and bleached palm oil for soaps. However, their potential has been limited due to numerous factors, including lack of access to competitive markets, inadequate storage facilities and lack of a facility to enhance value-addition. Secretary for Lusekelo Cluster, Luckson Kayange, says only a handful of the total palm nut harvest goes to Tanzania where it is processed into cooking oil and soap and the products are sent back to Malawi for sale. “We are losing a lot by selling our produce to Tanzanians. If we were to process these palm fruits and nuts by ourselves, Malawi could have benefited through job and wealth creation in this area,” Kayange says. By September 19 2018, Aphetson Mwalupaniof Group Village Head Mwakaboko had made more than 10 trips to Tanzania searching for markets for his cocoa nuts but did not get the value of his produce. In Tanzania, cocoa is sold at K1,300 per kilogramme (Kg). More than twice every month, tradesmen from Tanzania also visit his and other people’s homes to buy raw cocoanuts and take them to their country for processing. “They offer us very low prices for our cocoanuts. The best we get is an equivalent of K1,300 per kg. We are robbed of our wealth,” Mwalupani laments. He his is a typical example of farmers whose effort to produce high-value crops is rewarded with lesser or no profit at all. Mwalupani is a member of Tuye pa Mpene Cluster in the district, which has emerged from the Karonga-Songwe Road Project just like Lusekelo Cluster. The implementation of the project has resulted in the disruption of livelihood activities of some people, such as Mwalupani along the corridor. The government has since provided compensation to the affected people to help them restore their livelihoods to pre-project status or better. In order to ensure that the money is put to good use Comsip is training them in financial literacy, business management and savings and investment. Today, Lukeselo and Tuye pa Mpene clusters have organised themselves into regulated pre-cooperatives and are exploiting business opportunities such as palm oil and cocoa production. Both they are yearning for value addition. Tuye pa Mpene wants to process cocoa while Lusekelo eyes palm oil. Comsip Chief Executive Officer, Tenneson Gondwe, is offering hope for the clusters. 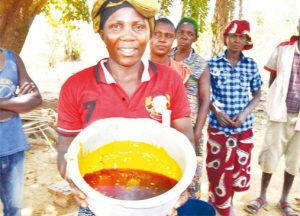 The construction of the 46kilometre road is supervised by the Roads Authority with funding from the World Bank and has unearthed the potential of Karonga as Malawi’s producer of palm oil and cocoa. Cocoa is used in the production of chocolate which is big business. In 2016, it was estimated that the global chocolate market was worth a staggering $98.3 billion. All over the world, countries are producing crops of cocoa beans but Malawi’s production is little known and supported, yet Ivory Coast, responsible for 30 percent of the world’s cocoa, earns its trade revenue from the crop. Experts say if farmers o add value to their produce through processing, there will be an increase in income and reduce financial stress, which will lead to the revitalisation of rural communities. Group Village Head Timothy Chibwana of Karonga believes Malawi, has not exploited opportunities at its disposal to earn maximally from its agriculture endeavours. Chibwana, who is also a member of Lusekelo Cluster, says growing opportunities for investment in agriculture infrastructure in Karonga could help overcome the challenges associated with poor access between farm-level production and downstream activities such as processing and marketing. He adds that investment in agriculture infrastructure opens the door to increasing the production of higher agricultural value-added products. “For so long, we have been very comfortable with the way we have traditionally handled agricultural produce. In Karonga and countrywide, most fruits, vegetables and other foods are eaten fresh and any leftovers are immediately thrown away. We cannot develop with that approach,” he says. Comsip provides both technical and financial support to clusters and cooperatives towards implementation of value chain projects. Technical support in form skills development is provided through trainings, coaching and learning visits. On the other hand, financial support is provided to qualifying clusters and cooperatives to undertake value chain projects on a matching grant principle.